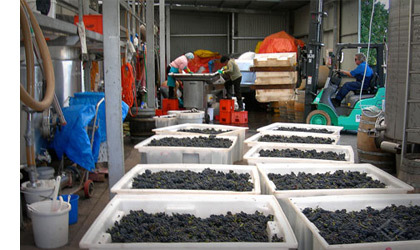 By all accounts, vintage 2011 was a challenge for most Australia wine growing regions. Phillip Jones is quite forthright about it by describing the conditions at his Leongatha South vineyard as “wet and cold” on the back labels of his current releases. After tasting a cross section of Bass Phillip 2011s, I discussed with Phillip Jones the work that went into the vineyard in those conditions so there was a crop worthy of effort in the winery. It seems to me that there is a lot said about winemakers and how skillful they are, and it’s true; but it’s equally the case that they can’t make a silk purse out of a sow’s ear, and a lot of year-round skill, experience and sheer hard work happens in the vineyard before the winery does its work. In the critical period, December 2010, and January and early February 2011, conditions were the coldest and wettest in Bass Phillip’s 30 year history, most days overcast and the vines constantly wet: conditions conducive to mildew. During this time every daylight hour was spent guarding against downy and powdery mildew, using biodynamic sprays, hedging and leaf plucking. The result was a crop around 80 percent of the usual, with slightly less ripe fruit than the norm. Despite the vintage conditions, the vineyards produced fine, textured wines in a vintage when many in the area simply gave up. This was in part due to effort in the vineyard, and in no small part to the deliberate vineyard architecture with high density planting and vines set for incredibly low yields. In Burgundy, the Grand Cru vineyards will have 10,000 vines per hectare and cropping levels around 1.8 tons per acre. Consider this: at Bass Phillip the density is 9,000 vines per hectare, cropping at an average of one tonne per acre. 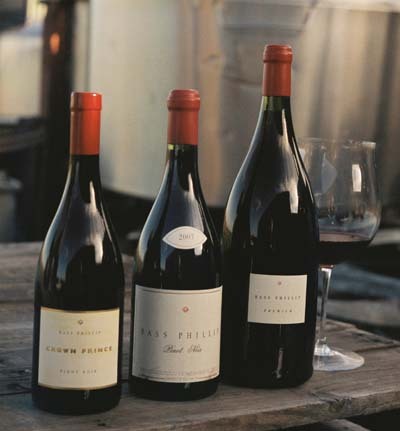 If you think about the mathematics, the vines at Bass Phillip produce about half a bottle of wine each. This is not going to please the bank manager, but great wines are made in the vineyard; they can’t be created in the winery. By comparison, most “low cropping” Australian vineyards are set at between 1,500 and 1,800 vines per hectare to crop at 2.5 tonnes per acre. And of course there were challenges in the winery as well, with the usual rigorous selection and blending trials, resulting in the declassification of a fair quantity of wine. The wines from vintage 2011? I tasted these in late November 2012. All are bottled using “ProCork” (I haven’t had a corked wine yet under this form of cork seal). These are as always, serious wines. They show not only the usual characterful Bass Phillip traits, but also vintage influences, which will enable (favourable) comparisons for some years to come, between the riper and the less ripe years. These wines weigh in at 12.2 to 12.4 % and might appear light on, but considering Bass Phillip’s usual modest levels which rarely challenge 13 % they are hardly puny by comparison. All the alcohol levels here do is indicate that you don’t need high levels of alcohol to deliver balance, fineness and texture with many dimensions of flavour. What they also show is the benefit of high density plantings, low cropping, vine age, understanding and meticulous management of vineyard and vintage conditions and skill and passion in the winery where the non-interventionist practices allow the full expression of vineyard characters.